I am writing to thank you most sincerely for all that you and your brother bishops in England and Wales did to make my first official visit in the United Kingdom such a success. Please extend my thanks to the civil and ecclesiastical authorities who worked so diligently to render my Visit to England so fruitful. I would ask in particular that you convey my affectionate greeting to the people of London who welcomed me so warmly. I am very conscious of the significance of the events of those days and the unprecedented opportunities afforded me, both by Her Majesty’s Government and by the Church of England, to build new relationships and to strengthen existing ones, including with representatives of other religions. 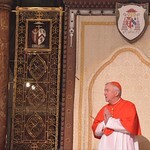 It was particularly moving for me personally to preside at the Beatification of Cardinal John Henry Newman. Finally, I am grateful for Your Grace’s hospitality at Westminster and for the welcome afforded me by the faithful of London, especially the young people and the elderly. Invoking the intercession of Saint George and Saint David, patrons of England and Wales, I willingly impart to you and to the bishops, clergy, religious and lay faithful in England and Wales my Apostolic Blessing as a pledge of grace and peace.